اندازه بنه مادری و مدیریت تغذیه، از مهم‌ترین عوامل مؤثر بر میزان جذب نیتروژن در زعفران (Crocus sativus L.) می‌باشد. به‌منظور بررسی نقش کودهای دامی، شیمیایی و اندازه بنه مادری بر کارایی جذب و مصرف نیتروژن در زعفران، آزمایشی در دو سال زراعی 92-1391 و 93-1392 به‌صورت فاکتوریل در قالب طرح بلوک‌های کامل تصادفی با سه تکرار در مزرعه تحقیقاتی دانشکده کشاورزی دانشگاه فردوسی مشهد به اجرا در آمد. در این مطالعه، اندازه بنه مادری در چهار سطح (4 گرم و کمتر از آن (کوچک)، 1/4 تا 8 گرم (متوسط)، 1/8 تا 12 گرم (نسبتاً بزرگ) و بیش از 12 گرم (بزرگ)) و منابع مختلف کود در سه سطح (کود دامی، کود شیمیایی (نیتروژن + فسفر) و شاهد (عدم مصرف کود)) به ترتیب عامل اول و دوم آزمایش در نظر گرفته شدند. بر اساس نتایج به‌دست‌آمده، در هر دو سال اجرای، با افزایش اندازه بنه مادری جهت کاشت (از سطح کوچک به بزرگ)، میزان نیتروژن (بر حسب گرم در مترمربع) در بنه‌های دختری و کل بوته زعفران به‌طور معنی‌داری افزایش یافت. علاوه بر این، استفاده از بنه‌های مادری بزرگ‌تر جهت کاشت به‌طور معنی‌داری منجر به افزایش کارایی جذب و مصرف نیتروژن در زعفران شد. همچنین در سال اول و دوم اجرای آزمایش، کارایی مصرف نیتروژن در نتیجه مصرف کود دامی به ترتیب به میزان 21 و 61 درصد بیش از کود شیمیایی بود. Mother corm size and nutrient management are the most important factors in relation to nitrogen uptake of saffron (Crocus sativus L.). In order to investigate the effects of mother corms size and type of fertilizer on uptake and use efficiency of nitrogen in Saffron, a field experiment was conducted as factorial layout based on a randomized complete block design with three replications at Faculty of Agriculture, Ferdowsi University of Mashhad, Iran, during the years 2013 and 2014. The mother corm size (4 g and lower (small), 4.1–8 g (medium), 8.1-12 g (relatively large) and over 12 g (large)) and fertilizer sources (cow manure 25 t ha-1, chemical fertilizer (N+P) and control) were the first and second experimental factors, respectively. In both years, the larger mother corms (8.1-12 g and more) significantly resulted in greater nitrogen content (g m-2) of replacement corms and whole plant of saffron. In addition, uptake and use efficiency of nitrogen were significantly increased with increasing mother corms size. In the first and the second years, nitrogen use efficiency in manure treatment was significantly higher than that of chemical fertilizer (by 21 and 61%, respectively). Ali, G., Iqbal, A.M., Nehvi, F.A., Samad, S.S., Nagoo, S., Naseer, S., and Dar, N.A. 2013. Prospects of clonal selection for enhancing productivity in Saffron (Crocus sativus L.). African Journal of Agricultural Research 8: 460–467. Amiri, M.E. 2008. Impact of animal manures and chemical fertilizers on yield components of saffron (Crocus sativus L.). American-Eurasian Journal of Agriculture and Environmental Science 4: 274–279. Amirshekari, H., Sorooshzadeh, A., Modaress Sanavy, A., and Jalali Javaran, M. 2007. Study of effects of root temperature, corm size, and gibberellin on underground organs of saffron (Crocus sativus L.). 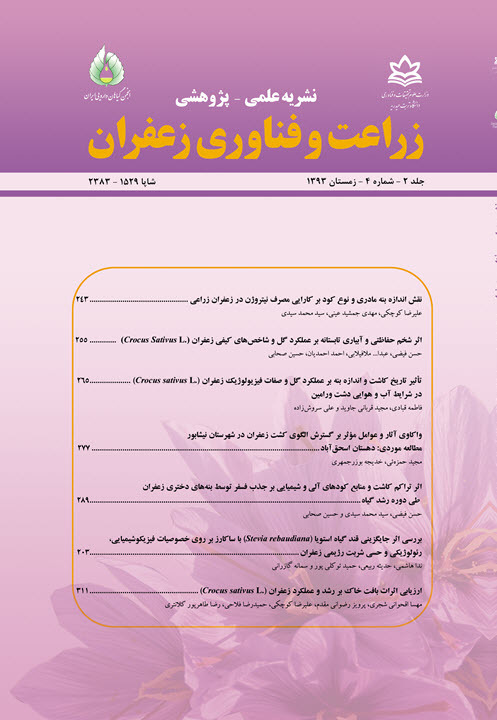 Iranian Journal of Biology 19: 5–18. (In Persian with English Summary). Ankumah, R.O., Khan, V., Mwamba, K., and Kpomblekou-A, K. 2003. The influence of source and timing of nitrogen fertilizers on yield and nitrogen use efficiency of four sweet potato cultivars. Agriculture, Ecosystems and Environment 100:201-207. Asadi, G.A., Momen, A., Nurzadeh Namaghi, M., and Khorramdel, S. 2014. Effects of organic and chemical fertilizer rates on nitrogen efficiency indices of isabgol (Plantago ovata Forsk.). Agroecology 5: 373–382. (In Persian with English Summary). Bertheloot, J., Martre, P., and Andrieu, B. 2008. Dynamics of Light and Nitrogen Distribution during Grain Filling within Wheat Canopy. Plant Physiology 148: 1707–1720. Chaji, N., Khorassani, R., Astaraei, A.R., and Lakzian, A. 2013. Effect of phosphorous and nitrogen on vegetative growth and production of daughter corms of saffron. Journal of Saffron Research 1: 1–12. (In Persian with English Summary). Delogu, G., Cattivelli, L., Pecchioni, N., De Falcis, D., Maggiore, T., and Stanca, A.M. 1998. Uptake and agronomic efficiency of nitrogen in winter barley and winter wheat. European Journal of Agronomy 9: 11–20. Fageria, N.K. and Baligar, V.C. 2005. Enhancing nitrogen use efficiency in crop plants. Advances in Agronomy 88: 97–185. Gresta, F., Lombardo, G.M., Siracusa, L., and Ruberto, G. 2008. Effect of mother corm dimension and sowing time on stigma yield, daughter corms and qualitative aspects of saffron (Crocus sativus L.) in a Mediterranean environment. Journal of the Science of Food and Agriculture 88: 1144–1150. Kafi, M., Rashed Mohassel, M.H., Koocheki, A., Mollafilabi, A., 2002. Saffron, Production and Processing. Ferdowsi University of Mashhad Press. 276 pp. (In Persian). Koocheki, A., Jamshid Eyni, M., and Seyyedi, S.M. 2014 a. Irrigation levels and dense planting affect flower yield and phosphorus concentration of saffron corms under semi-arid region of Mashhad, Northeast Iran. Scientia Horticulturae 180: 147-155. Koocheki, A., Jamshid Eyni, M., and Seyyedi, S.M. 2014 b. The effects of mother corm size, manure and chemical fertilizers on replacement corm criteria and yield of saffron (Crocus sativus L.). Journal of Saffron Research (Accepted for publication). (In Persian with English Summary). Koocheki, A., Nassiri Mahallati, M., Mondani, F., and Khorramdel, S. 2011. Ecophysiology of Field Crops: A New Perspective. Ferdowsi University of Mashhad Press. 614pp. (In Persian). Koocheki, A., Nassiri Mahallati, M., Moradi, R., and Mansori, R. 2012. Investigation of flow and nitrogen use efficiency in wheat production and consumption cycles (Triticum aestivum L.) and maize (Zea mays L.) in Iran. Journal of Agroecology 4: 192–200. (In Persian with English Summary). Koocheki, A., Rezvani Moghaddam, P., Mollafilabi, A., and Seyyedi, S.M. 2014 c. The effects of high corm density and manure on agronomic characteristics and corms behavior of Saffron (Crocus sativus L.) in the second year. Journal of Saffron Research 1: 144–155. (In Persian with English Summary). Koocheki, A., Seyyedi, S.M., Azizi, H., and Shahriyari, R. 2014 d. The effects of mother corm size, organic fertilizers and micronutrient foliar application on corm yield and phosphorus uptake of saffron (Crocus sativus L.). Saffron Agronomy & Technology 2: 3–16. (In Persian with English Summary). Kumar, R., Singh, V., Devi, K., Sharma, M., Singh, M.K., and Ahuja, P.S. 2009. State of art of saffron (Crocus sativus L.) agronomy: A comprehensive review. Food Reviews International 25:44–85. Lea P.J., and Azevedo, R.A. 2006. Nitrogen use efficiency. 1. Uptake of nitrogen from the soil. Annals of Applied Biology 149: 243–247. Mando, A., Ouattara, B., Sédogo, M., Stroosnijder, L., Ouattara, K., Brussaard, L., and Vanlauwe, B. 2005. Long-term effect of tillage and manure application on soil organic fractions and crop performance under Sudano-Sahelian conditions. Soil and Tillage Research 80: 95–101. Masclaux-Daubresse, C., Daniel-Vedele, F., Dechorgnat, J., Chardon, F., Gaufichon, L., and Suzuki, A. 2010. Nitrogen uptake, assimilation and remobilization in plants: challenges for sustainable and productive agriculture. Annals of Botany 105: 1141–1157. Nassiri Mahallati, M., Koocheki, A., Boroumand Rezazadeh, Z., and Tabrizi, L. 2007. Effects of corm size and storage period on allocation of assimilates in different parts of saffron plant (Crocus sativus L.). Iranian Journal of Field Crops Research 5: 155–166. (In Persian with English Summary). Omidi, H., Naghdibadi, H.A., Golzad, A., Torabi, H., and Fotoukian, M.H. 2009. The effect of chemical and bio-fertilizer source of nitrogen on qualitative and quantitative yield of saffron (Crocus sativus L.). Journal of Medicinal Plant 8: 98–109. (In Persian with English Summary). Ourry, A., Boucaud, J., and Salette, J. 1988. Nitrogen mobilization from stubble and roots during re-growth of defoliated perennial ryegrass. Journal of Experimental Botany 39:803-809. Renau-Morata, B., Nebauer, S.G., Sánchez, M., and Molina, R.V. 2012. Effect of corm size, water stress and cultivation conditions on photosynthesis and biomass partitioning during the vegetative growth of saffron (Crocus sativus L.). Industrial Crops and Products 39: 40–46. Rezvani Moghaddam, P., Koocheki, A., Molafilabi, A., and Seyyedi, S.M. 2013. Effect of biological and chemical fertilizers on replacement corm and flower yield of saffron (Crocus sativus L.). Iranian Journal of Crop Sciences 15:234–246. (In Persian with English Summary). Rezvani Moghaddam, P., Seyyedi, S.M, and Azad, M. 2014. Effects of organic, chemical and biological sources of nitrogen on nitrogen use efficiency in black seed (Nigella sativa L.). Iranian Journal of Medicinal and Aromatic Plants 30: 260–274. (In Persian with English Summary). Safadoust, A., Mosadeghi, M.R., Mahboubi, A.A., Norouzi, A., and Asadian, G.H. 2007. Short-term tillage and manure influences on soil structural properties. Journal of Science of Technology of Agriculture and Natural Recourses 11: 91–100. (In Persian with English Summary). Salvagiotti, F., Castellarín, J.M., Miralles, D.J., and Pedrol, H.M. 2009. Sulfur fertilization improves nitrogen use efficiency in wheat by increasing nitrogen uptake. Field Crops Research 113:170-177.